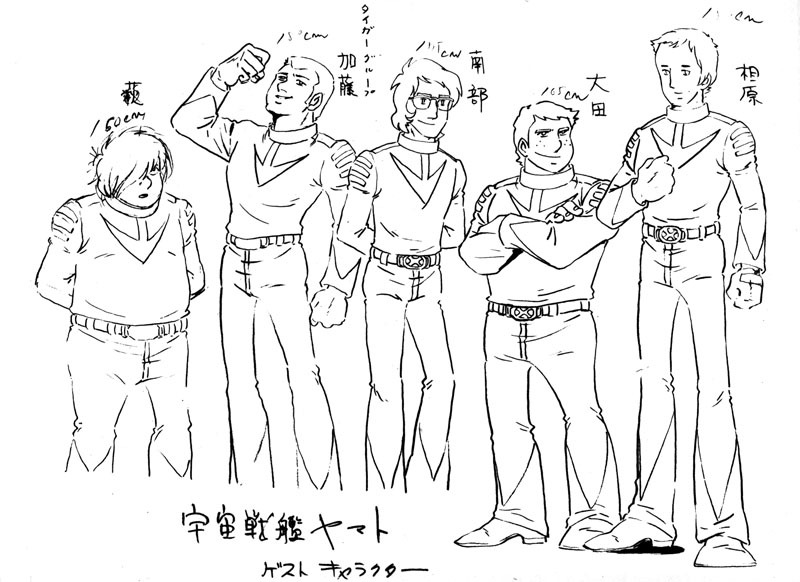 Like everything else about the first Space Battleship Yamato TV Series, the character design went through many phases before finally taking shape as the anime icons we know now. As reported in our Yamato Origins series, Leiji Matsumoto took over the process in April 1974, developing the story and the early character designs simultaneously. As time went on and the project got exponentially bigger, others joined him in the process. In terms of pure character design, the man most responsible for the final product was Chief Director Nobuhiro Okaseko. A veteran of both Toei Studio and Osamu Tezuka’s Mushi Pro, he had previously supervised two anime programs, the high school soccer series Akaki Chi no Eleven [The Red-Blooded Eleven, 1970] and the superhero series Gekko Kamen [Moonlight Mask, 1972]. The roots of Yamato‘s character design can be seen in both. Some of his other credits include Captain Tsubasa, Cutie Honey, Mighty Atom, Future Boy Conan, and the first series of Lupin III. He first worked with Producer Yoshinobu Nishizaki on Wansa-Kun (1973). By contrast, Yamato was Leiji Matsumoto’s first anime production, which meant it was the first time other artists would be required to imitate his style. The industry was still comparatively young in the early 1970s, and the prospect of finding an army of animators who could quickly learn to draw just like Matsumoto was unrealistic at best. (And it would take many more years for the talent pool to become deep and diverse enough to meet that challenge.) Therefore, Okaseko stepped in to find a balance. His task was to preserve what he could of the style that made Matsumoto a manga superstar while making the Yamato characters accessible to artists who came from completely different backgrounds. This lead to a lot of pushing and pulling that was educational for everyone. Looking at it through Western eyes, the Matsumoto style stood out immediately when Star Blazers was compared to its American-made contemporaries, but in many cases it was a significant streamlining of what his Japanese readership was used to (even a cursory comparison with his Yamato manga instantly proves the point). Shown here are the earliest Matsumoto sketches evolving into the finished Okaseko animation designs. Other contributing artists were Toyoo Ashida, who would go on to become a popular character designer and director in the 1980s, and fledgling animator Takeshi Shirato, who would later become the longest-working Yamato veteran of them all. Leiji Matsumoto’s early design gave a sense of Okita as a primitive man or eccentric scientist, a far cry from the refined character of the anime. The revised version with the peacoat is closer to the finished model. The design in the Series 1 promotional pamphlet was inspired by Captain Nemo in 20,000 Leagues Under the Sea. The final design was a compromise between the two. The major transition is seen as the costume’s collar takes shape. He was named after Jyuza Unno (a writer of classic Japanese SF) and Souji Okita (captain of the Shinsengumi police force in the late 1800s–see more information at the end of this page). His character was strongly modeled on Leiji Matsumoto’s father, a squadron leader in World War II. “Juzo” literally translates to the number 13. As revealed by Leiji Matsumoto in our Yamatour 2010 interview, the arrow symbol for all the crew uniforms was based on the tail insignia of Japan’s Fourth Squadrom, which flew the Nakajima Ki-43 Hayabusa. It was a stylized falcon’s tail. The first roughs for Shima gave him features and a hairstyle that were quite far from the finished version, but as Matsumoto got involved in other things time began to slip away and Nobuhiro Okaseko took a more active hand in refining the design. Additionally, Shima’s early costume came with a wrench insignia rather than an arrow, designating him as part of the ship’s crew rather than the combat group, and his outward appearance more strongly suggested a technician like Sanada rather than a navigator. Like Kodai, he started out with a five-head body and was upgraded to a six-head body with a slight height advantage over his rival. Matsumoto’s design sensibility was strongly preserved in the finished design for Yuki, since she took shape through his unique, elegant touch. Unfortunately, the subtleties were lost in the rush of the TV animation, particularly in the second half of the series. Her initial costume design was similar to Kodai’s with the arrow mark on the chest, and a dagger was added to her hip. The short-lived miniskirt was also discarded. The prototype for Sanada started out as one of Matsumoto’s designs for a villain, and he was originally meant to be about 49 years old. He was given hair in the next round and a costume closer to that of Kodai, but he still bore a resemblance to Dessler. Trimming his hair back to a military-style buzz cut brought him to his finished form. Matsumoto’s original concept was more strongly preserved in Sado than any other character, though the glasses came and went in the early part of the process. Though many of Matsumoto’s “potato-shaped” old men have simple white circles for eyes, Sado’s were always black, which gave the face more focus. His medical scrubs went from a gown to more of a t-shirt design, and his traditional Japanese clogs eventually became standard shoes. His character (especially the drinking) was based on a former art assistant to Leiji Matsumoto. “Sakezo” literally translates to Distillery or Brewing. The original Matsumoto design strongly communicated Tokugawa’s good nature even through scruffy hair and round glasses. His age seemed close to Okita’s in the beginning, so the glasses were to be a distinguishing feature. Of course, they were later eliminated as other elements came to the fore. In the end, he became a more outwardly genial man than the captain. Matsumoto’s acclaimed design for the first true TV anime robot was essentially a home run from the first roughs. The cleanup was done by the artists at Studio Nue, who added great realism with a three-sided isometric view. Parts of the rough were refined in this process, such as the joints and connections. Analyzer’s ability to disassemble himself is an artifact of Matsumoto’s first concept for him to be formed by two independent robots (named Migi and Hidari) who would bicker incessantly when separated but then combine into a genius. As a character first created by Matsumoto in his high school years (originally named Captain Kingston), he was offered up as an addition to the cast when Matsumoto joined the production staff. The plan was for Mamoru Kodai [Alex Wildstar] to change his identity to Space Pirate Captain Harlock after he was presumed dead. This accounts for several similarities between the designs, particularly the costume. Of course, it is well-known that when Harlock’s role was cut from Yamato, Matsumoto was able to retain full ownership of the character and give him a life of his own. Read the full story of Captain Harlock‘s involvement with Space Battleship Yamato here. Queen Starsha was, naturally, Matsumoto’s signature design with her long hair. Her clothes were originally meant to be translucent to underscore the elegant nobility of a queen from an alien planet. However, when she finally appeared in Episode 23, her hair was shortened and her dress became solid blue, which brought her back down to Earth. Her appearance changes somewhat between episodes 23 and 25 owing to the fact that Leiji Matsumoto did key animation for her in the former and Mr. Okaseko did the latter. Since the last few episodes were done in a rush, it was decided to eliminate the necklace from her costume design. Prior to epsiode 23, she only appears as a painted image by Matsumoto himself. Matsumoto’s first designs for Dessler gave him long hair and was reminiscent of Frankenstein’s monster. A cape was added along the way to make him more regal and his features gradually became more intellectual. When the collar was removed from his cape, the design was nearly there. His name is a combination of “Death” and “Ra” (Sun). According to Leiji Matsumoto, the verbal similarity to “Hitler” is coincidental. The remaining members of the lineup were sort of an afterthought; after production got underway, series director Noboru Ishiguro realized the bridge still had some empty seats to fill. Okaseko had been forced out of the series by illness, so Ishiguro assigned Takeshi Shirato, who had previously only assisted with character design, to develop three more crew members. He ended up creating the five shown above: Yabu [Sparks], Kato [Conroy], Nanbu [Dash], Ota [Eager] and Aihara [Homer]. It may seem odd that such important characters were left to chance, but since none of them were needed until Episode 3, they were not part of the initial design process. The Star Force was formed not only to retrieve the Cosmo DNA from Iscandar but also to put an end to the Gamilon invasion of Earth. How appropriate, then, that design elements of their uniform were lifted from symbols worn by a Japanese police force of the 1860s. The Shinsengumi were samurai “peace officers” who banded together in the late shogunate period. While most samurai wore browns, greys and black, the Shinsengumi wore flashy haori as part of their uniform. Their mountain-peak hems are abstracted in the sleeve and trouser cuffs of the Star Force. The mon [crest] on their shoulders, while subtler by comparison, also show up in the triple-bar shoulder chevrons of the Star Force uniform. According to one translation (source forgotten) I read years ago, the “No. 1 Position” means “My help comes from the heavens; I go to the heavens to receive that help.” This “double heaven” reading is said to predict great peril and good luck. Spurious translation or not, it is a spot-on description of the Quest for Iscandar. The uniform was not the only element Yamato borrowed from the Shinsengumi. Their ranks were also the source for many character names including Okita [Captain Avatar], Hijikata [Captain Gideon], Yamanami [the Captain from Be Forever], Todo [Commander Singleton], and Hajime Saito [Sergeant Knox]. It’s interesting to contrast this with the German-derived nomenclature among the Gamilas: Rommel/Domel, Goehring/Geru, and Hess/Hisu. Samurai vs. the Nazis? Now that’s science-fiction! Unsurprisingly, the Shinsengumi have achieved legendary status in Japanese pop culture, on par with some of our famed Wild West lawmen or the G-Men of the early 20th Century. Thus, they have appeared many times in manga, anime, films, and a high-profile TV drama titled Shinsengumi Peacemaker. The secret Leiji Matsumoto number code: in the first series, Kodai, Shima, and Yuki are 18. Mamoru is 27. Some sources list Okita’s age as 54. Add the numbers in each age separately and check your results.